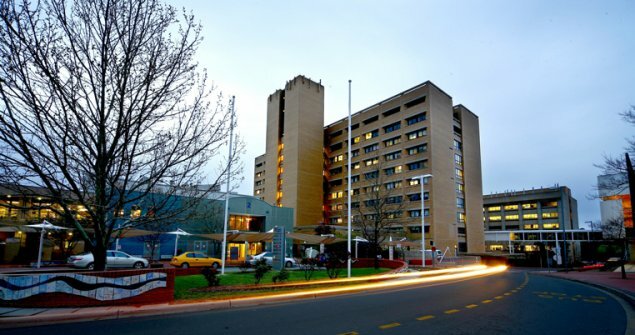 The man who allegedly bashed his former partner to death with a cricket bat at the weekend is under police guard at Canberra Hospital. Stephen Boyd, a suspect in the death of Tina Kontozis in her Bundeena home on Sunday, was transferred to the hospital on Tuesday morning. He received treatment for a broken jaw and injured neck sustained in the police chase that led to his arrest in Braidwood on Monday. Police believe he hit his head on the steering wheel when his car hit an embankment. Boyd, 51, is expected to stay in hospital overnight and remains under police guard while officers apply for an arrest warrant. Once he is sufficiently recovered from surgery, there will be a bedside hearing, police say. NSW Police will then likely have to apply to the ACT Magistrates Court to have him taken back into NSW jurisdiction to face charges relating to Ms Kontozis’ death. About 3pm on Sunday, NSW emergency services were called to a home on Beachcomber Avenue on Sydney’s outskirts where they located the body of a 51-year-old woman. Upon arrival police also found the woman’s 17-year-old son with an injured arm. He was taken to Sutherland Hospital for treatment. Boyd was arrested about 5pm on Monday, almost 300km south of the crime scene on Wallace Street, Braidwood, after being pursued by police. It is believed the pursuit began on the Braidwood Road, Boro, about 4.40pm after Highway Patrol officers recognised his vehicle. Boyd was arrested and taken to Queanbeyan police station before being moved to Queanbeyan Hospital and then transferred to Canberra. Why couldn’t he have been taken to Goulburn Hospital? Look at all the extra paperwork that is being created. Either that or get some form of mutual recognition on extradition matters between ACT and NSW. What happened to that MOU on ACT/NSW Regional matters that was signed with great fanfare a few years ago? There must be a big filing cabinet on London Circuit to hold all the MOUs that have been signed by our current government.